I did this little painting a few days ago. I have no idea what kind of fruit it is- inside is like jelly with lots of seeds. The produce is amazing here in Mexico. I love this striped plate and have taken a lot of photos with it. 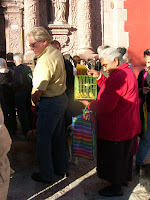 Yesterday we went to the blessing of the animals at the church. There were hundreds of people there and a multitude of dogs, cats, birds, lambs, goats and one scared rabbit. Blue was fancy in his flowered collar and dozens of people took his picture. He told me he wants his own blog now and maybe an agent but I said no. 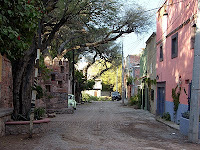 Here is our neighbourhod of San Antonio, in San Miguel. 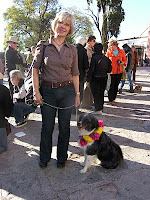 Also a picture of Diane, Blue and I on our way to the Saturday market. We had a violent storm yesterday with thunder, lightening, and torrential rain. Today was glorious- sunny and warm. Rick and I painted on the terrance all afternoon. Alan was feeling under the weather with the flu bug that everyone but me has been fighting. Up on the terrace we were seranaded by the cacophany of sounds that are San Miguel- roosters crowing, dogs barking, doves cooing, Spanish music wafting from passing cars and the cockateil from the next street over who does the same wolf whistle all day. 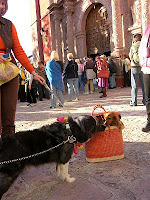 Tomorrow there is a blessing of the animals at a local church. We are told there will be lambs, goats, burros and lots of dogs and cats. Blue will go and be among the blessed. Photos will be coming of that. 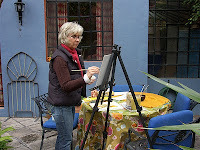 Here I am painting in the courtyard at our rented house in San Miguel. We have been here for one week now. It's beautiful here but the weather has been disappointing. Not much sun so far and quite cold. 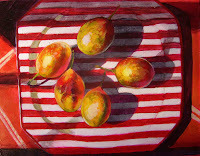 I've done a couple of paintings but nothing worth putting on the blog yet. 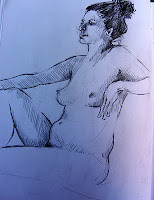 We have been to life drawing sessions, flaminco dance, and several tours. The architecture is spectacular and there will be tons of good material once the sun comes out. Tonight I'm going to a Chopin piano concert with a couple of friends.Blue is loving being a Mexican dog as we walk for miles every day.